“In order to make autonomous cars navigate more safely in difficult conditions – like icy roads – researchers are developing new control systems that learn from real-world driving experiences while leveraging insights from physics. Researchers at Stanford University have developed a new way of controlling autonomous cars that integrates prior driving experiences – a system that will help the cars perform more safely in extreme and unknown circumstances. 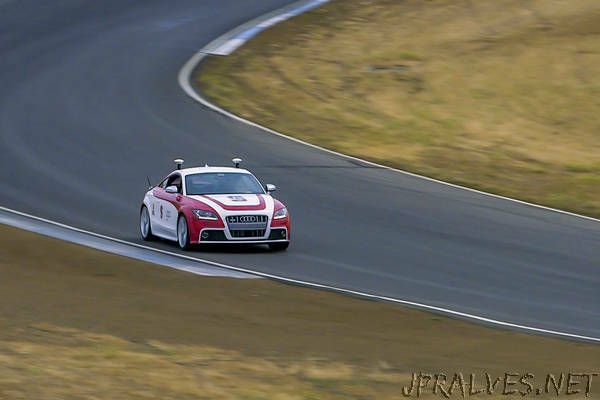 Tested at the limits of friction on a racetrack using Niki, Stanford’s autonomous Volkswagen GTI, and Shelley, Stanford’s autonomous Audi TTS, the system performed about as well as an existing autonomous control system and an experienced racecar driver. While current autonomous cars might rely on in-the-moment evaluations of their environment, the control system these researchers designed incorporates data from recent maneuvers and past driving experiences – including trips Niki took around an icy test track near the Arctic Circle. Its ability to learn from the past could prove particularly powerful, given the abundance of autonomous car data researchers are producing in the process of developing these vehicles. Control systems for autonomous cars need access to information about the available road-tire friction. This information dictates the limits of how hard the car can brake, accelerate and steer in order to stay on the road in critical emergency scenarios. If engineers want to safely push an autonomous car to its limits, such as having it plan an emergency maneuver on ice, they have to provide it with details, like the road-tire friction, in advance. This is difficult in the real world where friction is variable and often is difficult to predict. To develop a more flexible, responsive control system, the researchers built a neural network – a type of artificially intelligent computing system – that integrates data from past driving experiences at Thunderhill Raceway in Willows, California, and a winter test facility with foundational knowledge provided by 200,000 physics-based trajectories. The group ran comparison tests for their new system at Thunderhill Raceway. First, Shelley sped around controlled by the physics-based autonomous system, pre-loaded with set information about the course and conditions. When compared on the same course during 10 consecutive trials, Shelley and a skilled amateur driver generated comparable lap times. Then, the researchers loaded Niki with their new neural network system. The car performed similarly running both the learned and physics-based systems, even though the neural network lacked explicit information about road friction. The results were encouraging, but the researchers stress that their neural network system does not perform well in conditions outside the ones it has experienced. They say as autonomous cars generate additional data to train their network, the cars should be able to handle a wider range of conditions. Co-authors of the paper are graduate students Matthew Brown and John C. Kegelman and postdoctoral scholar Nitin R. Kapania, all of Stanford. Gerdes is also senior fellow in the Precourt Institute for Energy.